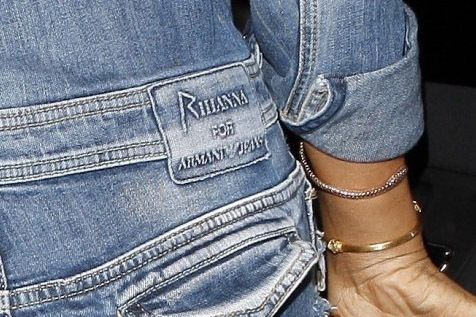 Did you know that Rihanna was designing denim for Armani Jeans? Not me either. But the results of this collaboration were unveiled for the world to see when the singer was snapped visiting Giorgio Baldi restaurant in Los Angeles in a striking denim jumpsuit which bears the label Rihanna for Armani Jeans. I LOVE IT!! Where and when can I buy it? I love it! Where can I but it? Who knows…I can’t find it anywhere online!!! Who knows…I can't find it anywhere online!! !